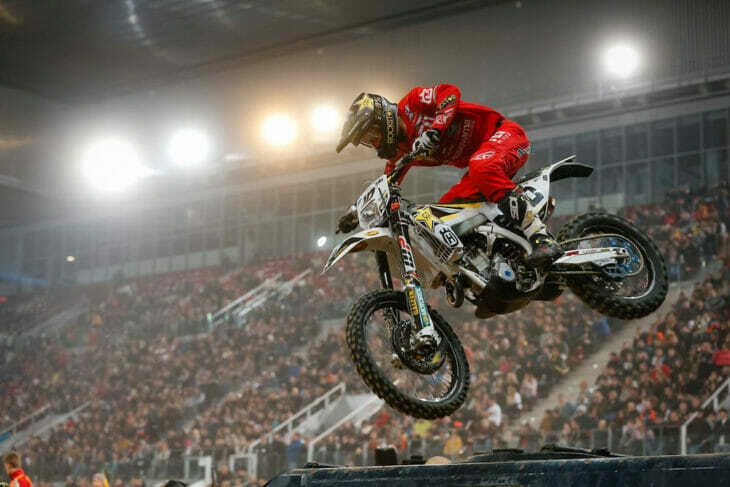 2019 Spain SuperEnduro Results – Colton Haaker (Rockstar Energy Husqvarna) is the new points leader in the 2019 Maxxis FIM SuperEnduro World Championship after taking his first moto win of the three-race-old series, which led to his first overall victory in Madrid, Spain, January 26. The red-plate holder going into the night, Cody Webb (Red Bull KTM), was slow to warm up to the track but what really hurt him on the night was a mechanic issue in the third and final main event that resulted in a costly DNF. He did, however, finish third in the first race and won the second to give him second in the overall standings, taking full advantage of other top-rider’s struggles through out the night, but, overall, it was a tough night for the defending champ. Spain’s own Alfredo Gomez (Husqvarna) made the 6000-strong crowd happy by finishing out the night on the podium with 9-5-2 results. But it was Haaker’s night in the end. He won the Superpole earlier in the evening to raise his confidence level to new heights and he made the best of it by winning the first of the three feature races. He led from start to finish in the first race, even though opening-round winner Taddy Blazusiak (Red Bull KTM) lurked from behind the whole race. Haaker ended up taking the checkered flag seven seconds ahead of the Pole. Webb, meanwhile, rode well in the race but too many small mistakes relegated him to third place. Starting from the second row in race two, Webb managed to avoid a first-lap pileup that swallowed up many riders, including Haaker and Blazusiak. Both Haaker and Blazusiak got back up and started making their way up through the pack. They both eventually caught up to the second-placed rider, Spanish trials star Pol Tarres. On the last lap, and as they crossed the finish line, Haaker made his move for second place when the two riders, Haaker and Tarres, collided in midair! Haaker was credited with second and Tarres third. Blazusiak also went down hard in the madness and was unable to cross the finish line, needing medical assistance. He would, however, recover to start race three. Haaker had it much easier in the third and final race, winning handedly over Gomez and Russian David Leonov, while Haaker and Blazusiak had their problems. Webb was sidelined with broken chain resulting in a DNF, and Blazusiak suffered another hard crash that had the medical crew jumping into action once again. He managed to get going again and finish out the race but well down the field. In the points standings which sees a big shakeup, Haaker now leads by 13 points over Webb despite trailing Webb by eight points going in. Blazusiak is still third in the standings but lost many points to the two leaders. He now trails second-place Webb by 18 points with two rounds still to go. “The end result is awesome but it was an up and down night for me,” Haaker said. “It was nice to bring home the first race, but in race two, I came over the tanks [obstacles] and there were four guys in the valley and I had nowhere to go. I followed Cody into it and he made it through cleanly, but me and Taddy didn’t and we were tangled together. We seem to find each other together all the time, probably because were both so aggressive.